Yeah, but: Chant "don't buy, don't buy." The Long Version: It's Manfrotto that calls the MP3-D01 a "Pocket DSLR Support" with a 1.5kg load capacity, not me. This flat plate with three independent legs is designed to stay attached to the bottom of a camera and simply unfurl when it's needed. It does fit a DSLR well enough – it's far too big for other cameras – but it certainly does not hold 1500 grams. My D800 with the Sigma 35/1.4 should add up to 1555g, and the MP3 collapsed at the sight of it. Switching to the 60/2.8G lens brought the weight down to 1325 grams, and brought down the Manfrotto as well. It could mostly hold the camera with the 50/1.4G attached – 1180 grams – but I'd never rely on it for that task. In fact, my Joby Micro 800 – with a rated 800g capacity – did just as well at that level. 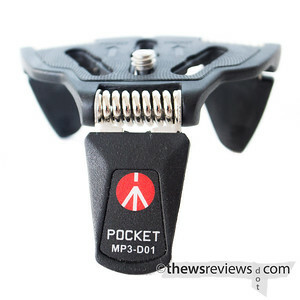 The MP3 has plenty of strength to hold little pocket cameras, but it's far too wide to be elegant. Manfrotto does explicitly say that it fits large cameras, so its unsuitability here shouldn't be a surprise, even though this is finally within its actual weight capacity. So the only cameras that it really works with are the smaller ones with interchangeable lenses, as long as those lenses don't project below the camera body. My Nikon V1 works, even with the large 30-110mm lens, so that's a win. Put another way, the non-musical MP3 is most suitable for cameras that have the memory card next to the battery, the door to which its broad breadth will almost certainly block. 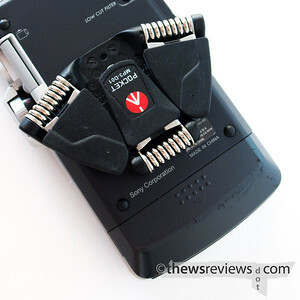 The thinness of the MP3-D01 necessitates a thin and fiddly little attachment screw, which can be positioned in any of three slots to let the camera balance on it. This makes the tripod-thing awkward to remove and a nuisance to attach, but I suppose when a well-engineered product performs at this level some sacrifices must be made. 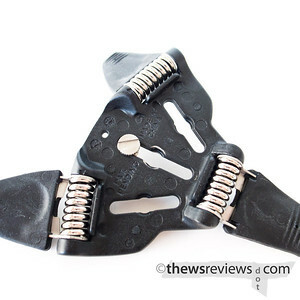 While I hardly ever actually use it this way, I have found one application that suits the little Manfrotto pocket tripod. It can hold my audio recorder off of a table, angled upwards enough to be useful, and doesn't block any ports or the battery door in the process. In this case its thinness really does let it stay attached to the recorder when it's in use or being carried, just like the promo material says it should. 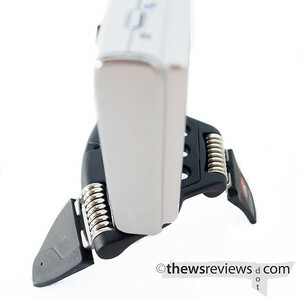 The slightly thinner profile of the Manfrotto MP3 is its only advantage over the Joby Micro 800 that I usually use. The Joby is simply better in every other way, whether using it to support the camera or while using the camera with the support folded away. More elegant design, easier to attach, easier to use, less likely to obstruct battery doors, no little screw to lose, and significantly cheaper as well: at the time of writing, B+H has the Joby Micro 800 for $20 versus the MP3 for $35. Seriously. Buy the Joby instead.